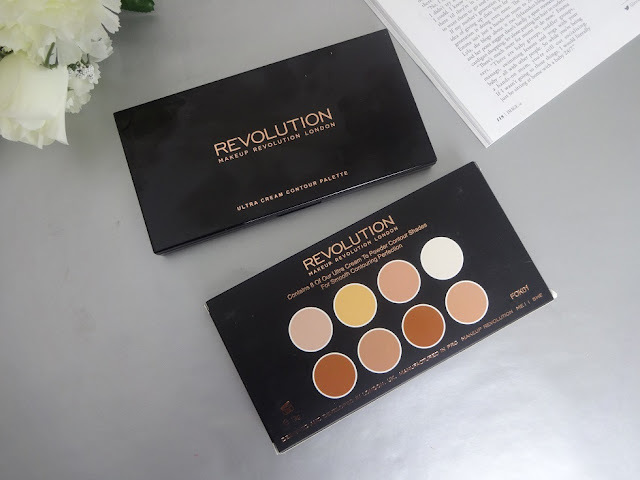 For today’s blog post, I thought I would do a review of the Makeup Revolution Ultra Cream Contour Palette. I had been waiting for it to come back in stock in Superdrug for well over a month and it finally came in. I was lucky I got one because they sell out pretty much as soon as they arrive. The only reason I was able to get one was because I got one of the girls to put it on hold for me. Anyway, on to the review. The first thing I noticed about the palette is the really sleek, simple packaging. It’s a black palette with gold lettering. This is one of my favouirte things about the Makeup Revolution palettes, other than how inexpensive they are. It sort of gives the palette a professional feel. The palette came with 8 shades and a nice sized mirror which is so handy while you are doing your makeup. The shades in the palette range in colour, from lighter colours (to highlight) to darker ones (to contour with). I was pretty happy with the shade range in the palette for my skin tone (which is quite pale) but I could see it being a problem for people with darker skin. The darker shades aren’t really that dark and I feel they might not show up very well on dark skin. Below are the swatches of the shades. I feel I have more than enough shades to choose from when contouring with this palette. I prefer to use the darkest shade for my contour and then I use either the yellow toned colour or one of the peach ones to highlight with. The white glittery shade seems sort of extreme to me. The only thing I could think to use it for is to highlight my inner corner, otherwise I think it would look really severe. One thing I don’t really like about this palette is that the product is quite light. It doesn’t have much coverage so you couldn’t use them to conceal as well as highlight;You need a concealer too. I really love the conouring colours in this palette and use them all the time, but I find myself highlighting with concealer a lot of the time instead of using the highlighting colours in the palette. The palette cost €11.95 which is pretty cheap for a contour palette but since most of the time I only use one of the contour colours and highlight with something else, I’m not sure if it was the best buy. I’m glad I bought it and I use it all the time but I really wish the highlight colours had more coverage. I’ll still use them, but I heard a lot of hype about this palette before I got it and it was a bit of a let down, just a bit though. I still will use the highlight colours but maybe not everyday. This is so handy though when I am doing other people’s makeup, I find it so easy to contour with, maybe because I often do my younger sisters and her friends’ makeup and they don’t need much coverage, or maybe I just have really bad dark cirles that need a strong concealer. Anyway, overall I do like this palette. It was a bit of a let down after all the hype but I like it and use it a lot. The shade range was perfect for my skin tone but mightn’t be that great if you have very dark skin. Because the palette was so inexpensive, I was pretty happy with it. It was definelty well worth €12. Have you ever tried this palette, or anything else from Makeup Revolution? Let me know what you thought in the comments section below. Talk to you all soon.